Great post-ironic documentary from the future on The Network as it may be. 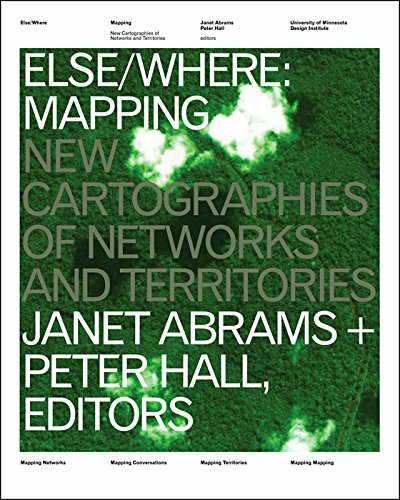 Else/Where Mapping edited by Janet Abrams and Peter Hall is one of the most loruvilous books I’ve wrapped my paws around in a long time. I just lurve books that are full of gorvilous rich color illustrations and photos and with enough writing around them that I can dip in and dip out without feeling I have to go from cover to cover. Maybe it’s my becoming a cybrid hyborg or something around my exposure to the new kinds of networked digital public media literacies I’m "researching", but sometimes it’s nice to look, flip, read and wonder. I’m torn about Amazon Prime cause it’s an ecological disaster 2.0, but if you have enough in your cart for it to make environmental sense to fuel up a jet, fly it from Tennessee or wherever, and have a brown trousered guy drive a truck from the outskirts of your city to your doorstep, please order this one! Required browsing material! full disclosure, PDPal, Times Square Edition, which I did in collaboration with marina zurkow and scott paterson, is one of the featured projects, herein. 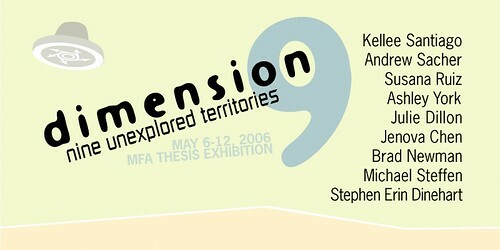 Interactive Media Division Thesis Show 2006: "dimension 9"
I flew this weekend to Las Vegas, where you can get anything except decent cell service and free wifi, to attend the Digital Cinema Summit, part of the ginormous annual National Association of Broadcasters (NAB). The summit was co-sponsored by the Entertainment Technology Center at USC, which runs a digital ready theater in Hollywood and is closely associated with the School of Cinema-TV. Those are the business practice prime motivators, and they were discussed passionately during several of the talks. Not unsurprisingly, James Cameron’s key note talk focused much more on the creative motivators. Cameron is passionate about the possibilities for 3D, and the really compelling 3D experiences are enabled by digital cinema. Cameron’s been playing around with this stuff, as he explained, for quite some time, including early experiments with simply slapping two cameras side-by-side to shoot stereoscopically. He’s also experimented with shooting 3D on a large selection of platforms â€” handheld, steadicam, helicopter, cranes â€” so as to prove to himself and others that, technically, 3D is entirely possible. But, he brushed all of that aside to underscore the point that the technical instrumentalities matter little without compelling stories. He likened a fetish of the technology to the early 3D anaglyph films of yesteryear â€” they were horrible stories. In fact, they maybe turned audiences off of 3D, except for the hard-core enthusiasts. And hard-core enthusiasts alone do not make an audience. His point was well taken by the audience. “We” can’t do 3D for the sake of 3D. It needs to be done to create a richer visual story experience. Digital, by most accounts, offers the opportunity for a richer visual experience than film, but even if you argue that â€” as some of the alpha geeks did â€” it is hard to argue that it provides an impeccably consistent visual experience. Digital doesn’t degrade the way film does. It’s digital â€” it’s either there, or it isn’t. After running through the gate in front of nuclear hot lamps, film degrades, perfs tear, splices are made â€” the film ages quickly over the course of its showing, in this regard. If you see the print at its first showing, you’ll likely be satisfied. If you see it after it’s 50th, you may notice a jerk in movement where a splice was made, or a speckled rash of scratches where a bit of dirt had its way with the celluloid. 3D experiences, as mentioned, are also a component of the richer experience. We saw a bunch of 3D clips and they’re fun. It’ll remain to be seen how 3D works in other cinematic idioms besides the action spectacular where the money shot is some hero stomping his foot on a break pedal, which makes for cool 3D. Will Nora Ephron move towards 3D? Probably not, but perhaps in a generation, 3D will become as common as color or sound and filmmakers won’t even think twice about shooting 3D. In 20 years, shooting in “2D” may be like trying to shoot using a super-8 Bolex or something. This was a motivator that made my ears perk up. Cameron has an attitude that I think marks a visionary creative. He does what it takes to realize what he dreams and what he thinks will be neat. Of course, he’s got a nice little chest of cash to play with. Regardless of the financial aspects, creating things that you think are cool will undoubtedly be seen as cool to other people, too. Cameron explained that filmmakers want the stuff they need to make the stories they want to tell, without being too clutered by business models. He explained that the right attitude to have is to be driven by what you think is cool, not what you think will make lots of money, or fits neatly into present business models. Now, certainly, that’s easy for a filmmaker like Cameron to say, who has a big ball of dough with which to play, but the point was well received. Digital cinema will be resonant with audiences because of great stories with a great visual experience (not much with audio will change â€” not as revolutionary as the move to digital audio back when that happened with Jurassic Park.) You get audiences by having great visual stories and great visual storytellers. Digital cinema, as presented here, addresses a number of business and creative issues. The business issues are fairly straight forward â€” security, distribution, and increased attendance. Obviously, piracy is an enormous concern for the the movie making enterprise. I haven’t read, nor do I intend to read, the entire digital cinema initiative specification, but one presenter mentioned that the bulk of it is composed of specifications for the security standard. Digital media can be encrypted more securely than “hard” media like shipments of film. Besides securing the actual transport of the digital film, digital projection and digital theaters also can be equipped with some mysterious technique that “jams” camcorders, another of the headaches theater owners face. There are costs associated with digital cinema distribution, certainly. The instrumentalities for handling the data in the theater are significant. One cannot take for granted what material infrastructure, software, redundancy systems, customer service, bandwidth, etc., are needed to store 200GB of digital media. Operationally, digital cinema is a sophisticated operation after post-production. There are data centers managing satellites, racks of digital technical equipment that are so new that no one knows entirely how they may fail, etc. As John Fithian of the North American Theater Operators Association (NATO, unfortunately) mentioned, digital is electronic, and electronic means that things break, and that things require technical expertise that does not yet exist as wide spread as will be necessary. If data that took 10s of hours to deliver for an evening screening is corrupted or a disk crashes or your redundancy system fails, you miss a screening and have turned off an entire audience to the experience. This is the strong marketing hook for exhibitors â€” if you can create a better experience for an audience, you can then recapture some of the lost attendance that cinema has faced over the last years. If digital can deliver a richer visual cinematic experience, maybe people will start going back and perhaps even pay a bit more. Some things won’t change about movies â€” they have to have a good story, great scripts, etc., no matter what the tools are. The technology doesn’t sell theater seats â€” you can’t market digital cinema as digital cinema by itself. Particularly with 3D, simply doing 3D is archaic â€” it’s like the anaglyph 3D films of decades ago. They were horrible stories. Cameron made us all chant, “Red, Blue â€” Bad”, which was pretty funny and mostly an inside joke amongst 3D enthusiasts. It’s okay if you don’t get it. It isn’t even one of those “you had to be there” jokes, just geek humor. (I have to agree, and one of the reasons I find mobile cinema rather perplexing. Watching any cinematic experience on a postage stamp sized screen just doesn’t seem fun, nor fun to develop or produce. Now, I like the idea of mobile devices as touch points for various kinds of media experiences, but a full cinema or television story? I’m waiting to be convinced that this is a valuable area of research â€” it’s just not interesting to me presently. And that’s partly driven by the challenges of trying to get media onto a phone. I like problems that I can at least prototype in the laboratory in my backyard shed, and don’t require networking the consent of some business people at a major cell phone service provider. Live simulcasts â€” this is an interesting area of consideration, mostly for exhibitors, I believe. Having an event simulcast to theaters is one opportunity for the digital cinema ecosystem. For “private” or specialty events, like simulcast of an open heart surgery..in 3D..digital exhibition has great opportunities. But, beyond that, the opportunity is lost to the challenges of current business practices associated with licensing and rights management, most of which I’d guess are locked in through long-term relationships between the event producers and television. I’m sure TV can’t be too happy about exhibition of these things in movie theaters. One last thing. Although I was only here for the weekend, and the full NAB event officially starts on Monday, I got a slight sense â€” maybe it’s just me â€” that the “broadcast” part of the National Association of Broadcasters may be loosing some of its primacy to other, multivalent means of circulating media, content and experience. Why did I go for a $700 weekend in Las Vegas? Actually, $707 if you count the $7 the slot machine took from me? I’m trying to find out more about digital cinema, mostly because I’m a digital technologist in a School of Cinema-TV. I’m not a film maker so looking at how digital technology enables new kinds of cinematic experiences hopefully gets me thinking about the future of visual story telling and what i can bring to the game. It may be nothing, but I’m used to probing a vector for a bit and testing the air. The digital cinema summit was a bit of a gamble, because sometimes these trade show sorts of things can be very “insider” focused. I’d say this particular event was about a 50/50 mix of technical minutiae that was interesting, but not 100% legible â€” color gamut comparisons, the importance of particular screen materials, testing platforms, distribution and encryption techniques, etc. The stuff that was interesting to me, the other 50 of the 50/50, was more about the creative possibilities of the digital cinema platform. The 3D stuff was very cool, and I like to think of that in the context of the Vis-a-Vis platform. Same goes for thinking about how the creative practice of visual story telling changes when you’re able to provide a lower barrier to entry (in principle, technically speaking â€” the business barriers will likely still remain) for accepting content from independents who can save the expense of printing. Overall, I’d say it was worth the trip. The MASSIVE event yesterday was great. It was entirely worth the schlep down the 405. Nice discussions and blissfully brief presentations. Big up for Celia in particular and the rest of the organizers for the event. It was a great example of a great symposium. And normal food and stuff â€” not just bake sale stuff. Why do games matter for me? 1. They are excellent mechanisms for framing and asking questions about how social formations arise, how people articulate and imagine different kinds of worlds, how communities form and dissipate. 3. Associating play with the inhabited, physical world can create different points of view. That is the world of the alternate/augmented reality game, or games that take place not only online but inworld are ways to move the solitary or cocooned activities of online electronic games slowly out into the physical world. This is important, that transition inworld, for phenomenological reasons I have yet to work through, but it’s a chapter of the book, so I guess I’ll have to work it through. Heidegger? Hi. It’s Julian again. 4. Play allows for the embodiment of different social formations. You can wrangle a good old time or cavern raid or whatever and feel the sense of collaborative engagement and the satisfaction of social interactions. 5. Embodiment of different social formations, different points of view from what we’re typically accustomed to, and so forth can (aspirationally) yeild new considerations as to what goes on in the world. 6. Many aspects of first life are in the midst of catastropic failure. 7. Games and play can change perspectives on first life crises to make our world more habitable, more sustainable, re-invest a sense of preciousness for life, where life all too often is cheap and commoditized. this thread is related to my simcity 2k essay, which tara mcpherson just reminded me of, written in 1993, which prefigures this line of thinking, for chrissake. it’s nice to see some continuity. I’m working through some questions related to the geospatial web. You know, the thing that some expect to arise when information that is buzzing within the data storage devices of the Internet are obtainable/searchable out there..in the normal human physical world.. Of course, the questions get slippery and difficult to frame fairly quickly because there aren’t that many good examples of good examples of what the geospatial web might look like. Don’t talk to me about virtual sticky note apps, or movie theater time look-ups based on where you are. I mean, you can talk to me â€” I’m just having trouble getting excited about such things, mostly because they seem a bit forced. I like the idea of spatial annotation, although I’m not entirely sure why. And I like the idea about being able to do semantically relevant things while I’m out and about and not just sitting in front of my screen at a fixed desk. But I’m an exception. I’m super alpha, which isn’t a boast â€” it’s about being weird and iconoclastic and peculiar to such a degree that no one knows what to do with me, so I just go and do what seems exciting to me. I’d say 8 out of 10 times, speaking modestly, being an iconoclast helps me make new stuff that is cool enough to be sustaining. Of course, at the same time I want to look to the future to see what is too geeky for everybody right now, but that might anticipate new kinds of geospatial social practices. One thing I’ve been hopped up on for awhile is the possibility for massively multiplayer collaborative mapping. Essentially, geotagging â€” adding geographic semantics â€” across the globe. What does that mean? It means providng a simple, low-barrier-to-entry mechanic to allow pretty much anyone geared up to surf the web, to add geographic semantics to any arbitrary web resource. It’s a question â€” how do you do that? Lately, I’ve been working with a friend, Will Carter, former IMD grad student, now mobile technology guy++, to develop a little theory object to help figure these questions out. It’s got the friendly neighborhood “bookmarklet” semantics of del.icio.us, with some Yahoo! Maps seasoning. 1. Go about your web surfing business. 2. Huh.. Look at that.. While going about your web surfing business you found a web page that you think has some geographic relevance! Click on the “geotagstuff” bookmarket â€” youâ€™re now beginning the geotagging process. You’ll be taken to a lightweight page with an embedded Yahoo! Maps interface. You can do all the usual Yahoo! Maps things, like drag, zoom and double-click to identify a precise location. You’ll probably have to “tune” the map â€” simply enter some geo parameters in the “tune” window, such as a street address, town and state, or even just a town, or even just a state. Enter a helpful note to further describe the web page. Now click “Add Thing” , and you’re done. Easy peasy. 3. Go back about your web surfing business. Geotaggers of the world, unite! Okay, like..bunches of people have geotagged lots of web resources. The web is ripening with homebrew geosemantics. It’s a bumper crop of geospatialized web stuff! The “so what” for “geotagstuff” is answered through access to the “geotagstuff” feeds. Yep, that’s right. Another feed. But, this one is made by you and based entirely on geographic coordinates. You’ll be able to get a feed based on geographic coordinates. Want to find out what’s going on around Union Square in New York City? Go to the feed generator, do some Yahoo! Maps scroll abouts, and right click on the feed badge and paste it into your favorite newsaggregators subscribe-to-feed box. Want to find out what’s going on between Los Angeles and Las Vegas cause, like..you’re road tripping this weekend? Do a multipoint click-click-click thing all along your route, right click on the feed badge and paste it into yourfavorite newsaggregator. And we’re making “geotagstuff” smart for our favorite rich media photo sharing blogging streaming sites. If you geotag a flickr page, the image will show up in the feed. Reckon we’ll do the same for the video whatever sites. If they survive all the cease & desist mishegoss. Why do I blog this? Cause this is another theory object. Yep. Another one. But now maybe it’s becoming clearer what those things are good for. Got some questions? Build something to help answer them. In this case, I have questions about geotagging practices â€” what is the geospatial web and how does it come into being? How are normal people going to participate in this? How do you geotag things without having to screen scrape every mother loving web page and hope to Christmas you find some geographic meta data? Can geotagging be homebrew? Can it be collaborative? Can it be massively multiplayer? We’ll see, theory object style. It’s the new dot-com. Limited beta soon, probably mid May. Ping me if you’re interested in being involved. But I’m also interested in ways that the linkages between event images, or images taken at particular places can be linked in other ways â€” like the flickr camera we thought through in the workshop..a camera that was a Blogject that was able to disseminate to other proximate cameras either the photos it took or an index to its (the camera’s) flickr stream so that the second camera could link (as in, become contacts with) to the first camera and more seamlessly share photos from the event. So, the scenario is something wherein tons of people are at the same concert, all taking photos, but most are strangers, so they don’t know who else is getting coverage. If their cameras can talk, they can help make the link. The scenario isn’t one that completely closes a gap in linking people and their cameras together â€” tagging helps, too. Folksonomies can muddy the waters, but with enough variation, you can make links. But, like Weinberger reminds us, some of the leaves are going to get blown and scattered â€” structures in which small pieces are loosely joined are inevitably going to lead to small pieces breaking off and rolling under the sofa. What are ways to mitigate that kind of loss? Provide another layer of linkage, let the devices help us cohere in a more formally taxonomic structure. Formalize the taxonomy with things like location, time, event name â€” not only just the folksonomies. And sense human social beings are not the best at rigid taxonomies (like latitudes or timestamps or proper names of events with the correct spelling, or agreeing upon the proper name of locales or events), let devices, that have protocols for arbitrating and agreeing upon differences without getting in too much of a huff (although that could be argued) help out. Recently I worked closely with Carolyn Strauss of Slow Lab on a proposal for a kind of messaging delivery architecture that had a deliberate aesthetic component, and derived from a metaphor of paced slowness. The idea of having a variety of mechanics for social communication is important, I think. Rather than just email, instant messaging, SMS, mobile mail, etc., we thought together about a channel of communication that was more deliberate and writerly. Something that was an adjunct to these fast-fast instant modes, we architected something that was a kind of gummed up transport that, besides being slower, created a sense of anticipation on the part of the recipient in that they would be given some kind of unfolding, growing, articulation visualization indicating that a message was on its way. It may take days or longer for the message to arrive, but you’d know it was on its way. I say that this is an adjunct to email because it isn’t at all motivated by creating an alternative to email, but rather an additional communications transport to add to our quiver of existing transports. So, I’m mentioning that to mention another kind of theory object style project, that I’m sure has a rich precedent in previous projects and if any one knows of such â€” please do let me know. It’s an adjunct email client that falls within the class of ambient style render layers for the channels of communication we receive. Even for a “datavore” like myself, the constant “bling” of new emails and the continuously up-ticking register of how many unread “articles” in my NetNewsWire trough of feeds can be debilitating at times. Rather than seeing these numbers grow and grow, I like thinking through some of the considerations that Paul Dourish in “Where the Action Is”, John Seeley Brown and Mark Weiser do in their essay “The Coming Age of Calm Technology”, or Hallnas and Redstrom in “Slow Technology â€” Designing for Reflection”. How do we deal with data feeds when we’re not hungry for lots of data? In the coming pervasively and ubiquitously networked environment, with tons of sensors and a glut of data, how does one avoid data dyspepsia? Ambient modes of display, engagement and interaction is one way to consider how one would participate in richly instrumented pervasively and ubiquitously networked environments. Thinking of such environments as torrents of raw data is definitely not the way to think of a further evolution in the way we cohibitate with sensors, digital networked social communication, and such all. Such an approach makes it quite intractable and unappealing and, frankly, is the one sure way to frame the problem so as to make it impossible to derive a solution. Who wants to be one’s own data traffic controller? No one â€” we just want to get on with the task of making meaning in our own individual worlds, not managing data. My stomach gets in knots just thinking about what my email inbox might look like in the morning, and it’s not because I don’t like having lots of correspondence â€” it’s because email and the way it’s typically presented to me is just plain wrong. Electronic mail, metaphorically, borrows from postal mail, at least and there we almost never were in a situation to deal with 83 pieces of incoming a day, let alone incoming all throughout the course of a day. Lines and lines of subject messages becomes difficult to process and manage. I’d rather have another kind of visualization, something that was more palatable. So, I’ve been thinking through this problem. I think email, in particular, is ripe for another set of metaphorical underpinnings. The Slow Mail project is one attempt, and this other project to create adjunct visualizers for incoming mail is another. Arg..it’s a bit of a burn that “mail” is the built-in metaphor that undergirds both of these adjunct projects, but such is as it is. One idea for this adjunct email client sort of thing is to create a floating window on the desktop, similar to the way an IM client appears, that gives some kind of sense of the “presence” of particular messages â€” there might only be a few of these in a stack, regardless of whether there are 87 new messages in the inbox. One of the indicators might reveal that there are messages from someone that you’ve had several recent exchanges with â€” an ongoing and active correspondence. Another might be an indicator in a cool, mellow color, that you have several messages from a discussion group. Yet another might indicate a message from someone especially tagged as significant, etc. I’m thinking a simple step into this question would be to compose such a visualizer head-end in Flash, with a middle tier done in a language with which I have some fluency, like Java. It would really turn my server-side IMAP Mailbox into a database, walking the hierarchy to create some semantic inferences. Just simple stuff. Why do I blog this? Because right now, as I write â€” I feel threatened by my email client. I’m afraid to start it up because starting it up, takes me somewhere else, off the track I am on in the morning. I wish I had just a simple indicator that was almost like a pleasant garden before stepping into the day’s data blitz. This became SLOWMail, which received a Rhizome Commission for 2007. More here. Last night, the 3rd year Interactive Media Division students gave their thesis presentations. They were short, 15 minute presentations and an even shorter (imho) opportunity to question projects, sadly. Time’s a consideration, certainly, and I’m sure students get lots of time to have their productions interrogated and critiqued throughout the term, but I was eager to ask more questions â€” I had a question or two plus I’m sure follow-up, or just plan things to chat about for every student, but only got in edgewise for a handful. One project that got me thinking was Erin Dinehart’s mobile game “Journey of Jin.” The project is notable for its graphic illustration, and that its a quest-style game for mobile. That’s all good. But what I got hopped up about was Erin’s allusion to a question (that more-or-less saved me from asking sort of the same thing) that Scott Ruston posed â€” how is this game about mobility? Meaning, what aspects of movement, pedestrianism, motility, whatever â€” does this game reflect? At one point during the term, I had asked him to consider this, because the game by itself does not tap into any of the “typical” (knee-jerk) characteristics of mobility that you hear folks chatting about eagerly â€” there’s no locative element, no GPS, cell tower triangulation, motion sensors, etc. At the time a few months ago, Erin thought about it and wanted to think about how this thinking might decant into the game itself. But last night, what he said made me think about the really important characteristic of mobility that the game does tap into, which I’m just condensing into this awkward phrase â€” Mobile Distraction Portal. I kind of like it. Erin said the game was a place to escape to that is like where he went when he was a kid when he was herded around with his family and his brother was annoying him. Just a place to immerse into and become freely distracted by the activities around us. In some sense, this is the alter ego of the “casual game”, only it’s more explicit about a particular kind of casual behavior. Similar in many regards to what Souris described as those Blackberry moments when, in an elevator with lots of strangers, people unsheath their Blackberry’s or mobile phones and poke around in them so as to avoid looking down at the floor, up at the ceiling, or the back of someone’s head. Hey, I got it! Let's make the band pay..
Just a short note on this whole ACM SIGCHI 2006 conference mishegoss. Anne Galloway brought this topic up in a recent blog post. The fiscal conservative in me is glad I am not going, although the researcher and idea wrangler is terribly bummed. As Jofish Kaye, danah boyd and Paul Dourish have noted, the price to attend is positively bonkers. danah decided not to go. Paul has research funding that presumably covers the cost, although I’d guess he’s not too happy to have to a pay a fistful of scheckles more. Anne is going to crash CHI, which is awesome, and reminded me of my own mortifying experience of having to crash the very Ubicomp workshop that I organized last year. That’s right. With no research funding, but plenty of hard work organizing a workshop, I was still expected to shell out close to $1,000 to attend the conference and hold the very workshhop I organized. Whatever happened to sweat equity, anyway? It’s like making the band pay to play their own concert, no?